Shake up the classics and make this Asparagus Green Bean Casserole for your holiday meal! This green bean casserole combination was thanks to my brother’s dislike of green beans. I wanted to test out how a traditional green bean casserole would fare with the flavour of asparagus – and it was awesome! Adding asparagus to the classic green bean casserole made it ten times better, in my opinion. While this version has green beans and asparagus in it as I love both equally, you can totally replace all of the green beans with canned or freshly cooked asparagus. When I have my brother over (which means all of the major holidays) I am going to make this all asparagus and it’s going to be amazing!! 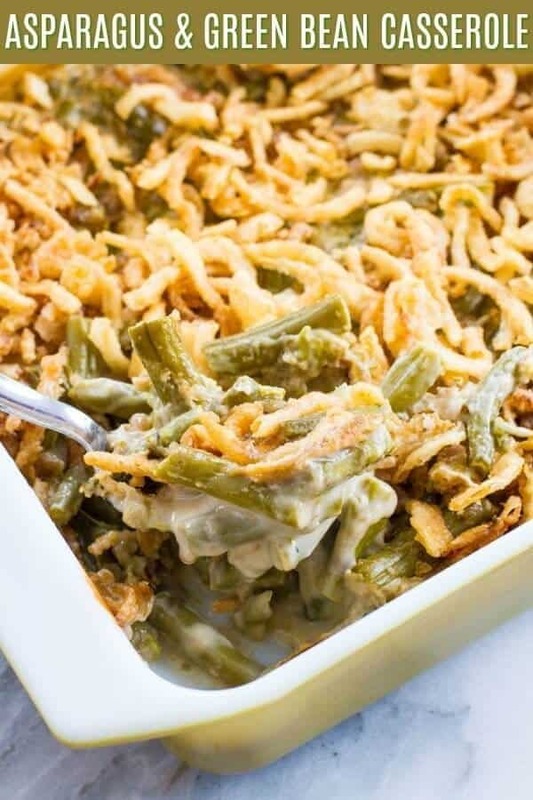 Common Green Bean Casserole Questions & Their Answers! 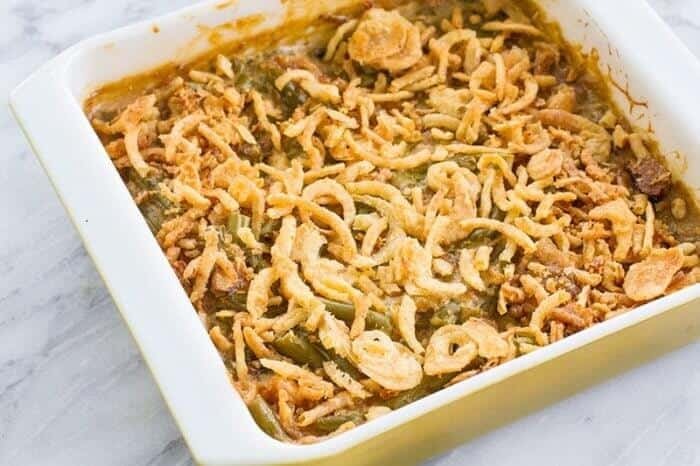 When was Green Bean Casserole invented? We can thank the people at Campbell’s for inventing the green bean casserole in 1955 to use their mushroom soup ( which is my favourite mushroom soup of all). This side dish is mainly used at Thanksgiving more than Christmas, but I think it’s a great recipe for every holiday! Using asparagus really switches it up to a spring dish! How many cans of green beans is 4 cups? Generally you can use two 16 ounce cans of green beans to get 4 cups, if you want to make the classic green bean casserole. You can work with the quantities given and substitute in what you want. You have a little bit of play when it comes to the quantity so don’t fuss if you have slightly more than 4 cups. What Temperature do I Cook Green Bean Casserole at? You cook green bean casserole at 350 °F. To be honest, you are mainly heating it up until it’s bubbling and hot rather than really giving it a solid casserole baking time. Then you are browning up the fried onions on top at the end for extra crunch and flavour. If you prefer to have your asparagus slightly crunchy, you want to avoid using canned asparagus. Use fresh (4 cups of asparagus that has been chopped into bite sized pieces) and steam until it is your desired crunchiness. Then simply use it in the recipe as directed. I like the canned asparagus with the canned green beans as they are soft. Either you are a lover or hater of soft vegetables in this green bean casserole, so pick your poison. I like the soft vegetables in a creamy sauce with the fried onions adding the crunch. You want to make sure that you drain the canned vegetables well or it will affect the consistency of the sauce, it will be too liquidy. This casserole is easily doubled or tripled and can be made in a larger casserole, just adjust your cooking times accordingly. 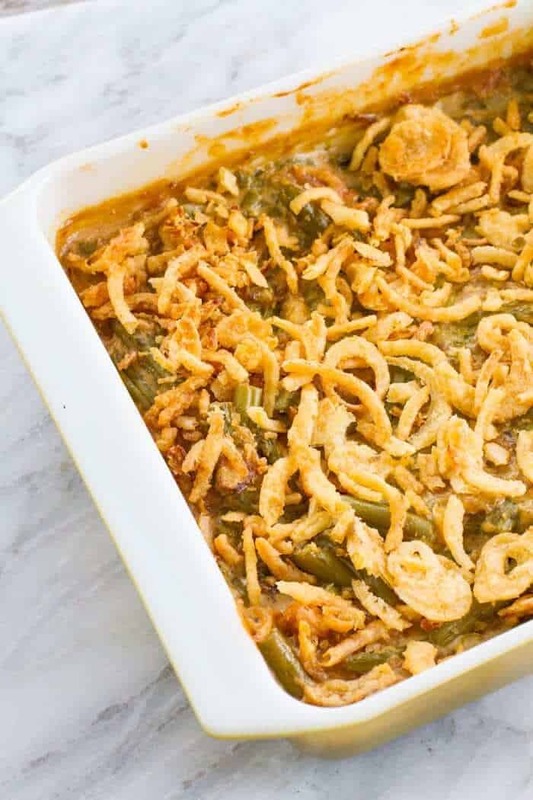 You can absolutely use fresh green beans in this casserole, simply don’t use the canned and use 2 cups of green beans that you steam until they are tender-crisp. Happy cooking! Has anyone else ever tried making green bean casserole with some asparagus? Let me know what you think in the comments below! Pin this Recipe to your HOLIDAY SIDE DISHES Board and Remember to FOLLOW ME ON PINTEREST! 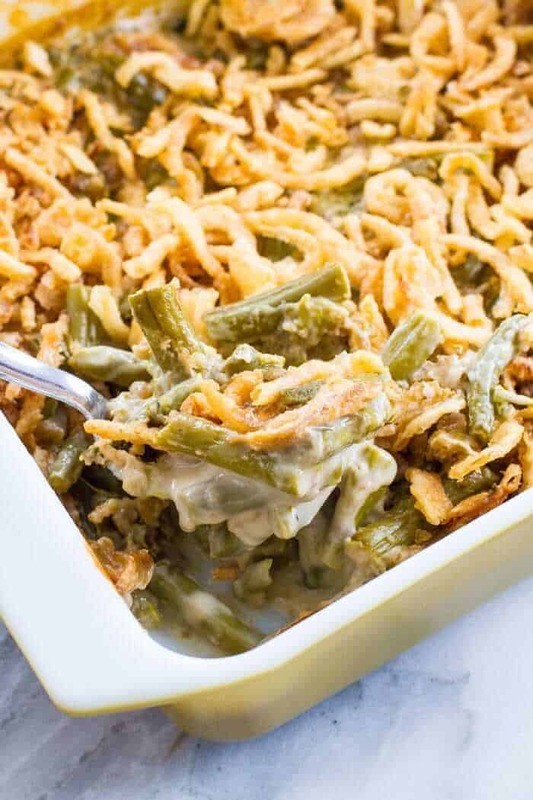 Shake up the classics and make this Asparagus Green Bean Casserole for your holiday meal! Whisk together the soup, milk, soy sauce and black pepper until smooth and creamy. Add in the asparagus, green beans and 2/3 cup of the fried onions. Mix in a 1 1/2-quart casserole. Bake at 350°F for 25 minutes or until the bean mixture is hot and bubbling. Sprinkle with the remaining onions. Bake for another 5 minutes or until the onions are golden brown. You can make this with fresh green beans as well, just steam them beforehand and add them in! We have been making this recipe strictly with asparagus for about 5 years now. This year I was hoping to do something a bit different! The idea of combining the 2 seems to be just the ticket! We absolutely love this casserole and it is truly a family tradition! Thanks for the additional idea!! Hello, I’m just a little confused. Your recipe states 2 cups of canned asparagus, but when you’re talking about using fresh asparagus you say 4 cups!?!? I have some fresh asparagus here, but I’m not sure if I should add 2 or 4 cups. Thanks for your help, the recipe looks delicious! Hey! sorry I wasn’t clear, I meant if you wanted to make it ALL asparagus, it’s 4 cups ( it’s 4 cups total of any and all vegetables in this). My bad! I will fix it so it’s clearer! Ohhh, ok! I gotcha, thanks so much for your quick response, I look forward to making this! ?